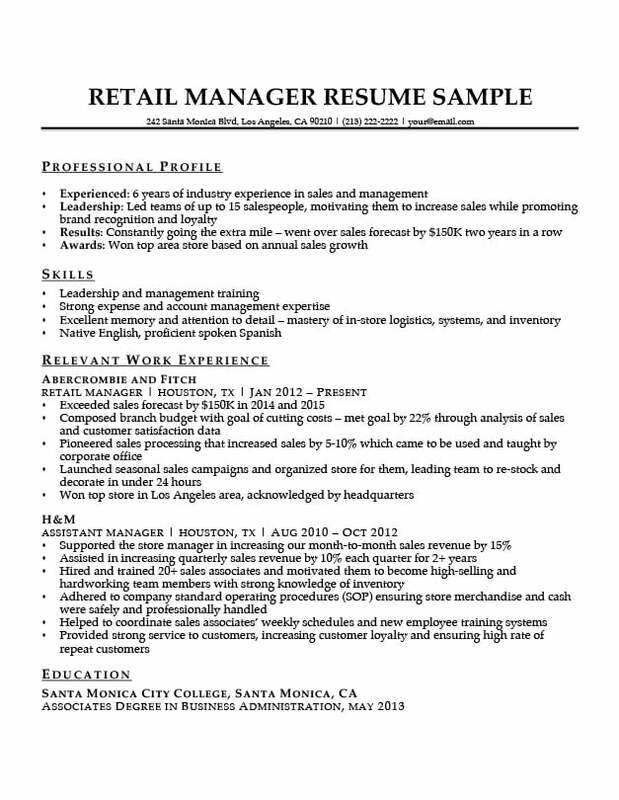 A great resume is organized, efficient, and communicates ideas well – just like a great retail manager. 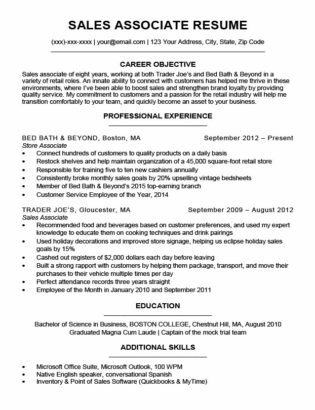 Check out our retail manager resume example and industry-savvy writing tips to help you create the perfect resume and land your next job! Or, if you are short on time, try out our easy-to-use resume builder. 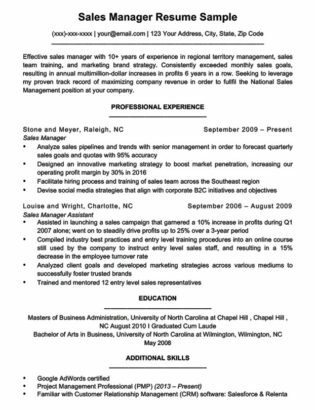 Below are two examples of a retail manager resume; one with a professional profile, and one with a summary of qualifications. Check out our qualifications summary guide to figure out which one suits you best. Want to see different resume samples? Peruse our resume database. Interested in different resume designs? Enjoy our wide range of resume templates. There’s more than just one method for writing a resume for a Retail Management position – to learn more about different resume formats, see this article. Be sure to take a look at these other related documents below as well. Need some more help? Check out our collection of excellent cover letters for further pointers on how to make yours the best it can be. 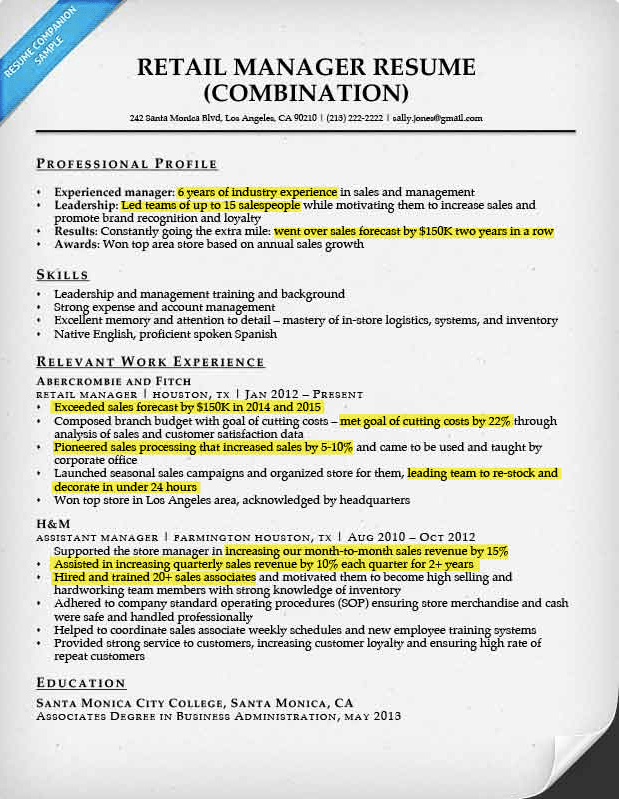 A resume profile is broken into four primary sections, which are typically divided into bullet points. If you have no idea how a resume profile works, read on or check out our free comprehensive guide on how to write a resume profile for an in-depth explanation with examples and tips. Your first section should focus on your experience. If you’re applying directly for a managerial role somewhere, you definitely have some work experience. Place your most relevant examples at the top. The second section will highlight an area of expertise, or some relevant area you thrived in while working at your previous job. For example, if you have a strong affinity for leadership, then make sure to mention how you operated as a leader at a previous company. In the third section you can discuss your skills and also the results of those skills. Just a quick highlight of your most relevant ones, you can dive deeper into them in the skills section of your resume. In the fourth section you top it all off with a career achievement. This should be an example of how you made a positive impact on a former company, and is a great way to give a hiring manager tangible evidence of your competency. Numbers will help solidify your application and make you a stronger candidate. How many people have I been responsible for managing? Did my store see an increase in sales during my time working there? How many employees did I train? Did the number of employees at my store grow during my time working there? If so, by how many? Did I play a role in this growth? Did I implement any programs that increased sales or efficiency? If you can answer any of these questions with numbers, you’re well on the way to bolstering your resume. The best managers are strong leaders. Directing a team and keeping them oriented toward the same goals takes skill – illustrate this skill with examples of leadership from past jobs or with examples from the time you were in school. If you were the President of the Student Union your senior year of college, that’s valid leadership experience. If you have led teams at other stores, get that information on your resume. Are you ready to get your resume started? 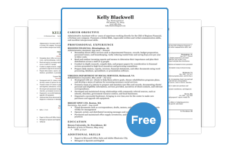 We have a wide variety of free, downloadable resume templates for you to check out at your leisure. If you’re short on time or just want to make things easier – try out our resume generator and build your own resume in minutes.